When Nick and Jess partied with a bunch of college students late last season on New Girl, they came to the realization that they were no longer the young partiers they believed themselves to be. Hanging out with a bunch of college students was no longer fun; it was just creepy. In “Neighbors,” Jess and Schmidt come to a similar realization. They may not be as young or cool as they believe themselves to be, but at this point in their lives, that shouldn’t be their priority. Jess is still in her post-teaching doldrums, stuck working in a place called the Casserole Shanty (where it seems wearing a visor is part of the dress code) and has spent the entire day watching nothing but Family Matters and other late-’80s/early-’90s sitcoms. During her lazy day, four new neighbors named Fife, Sutton, Chaz and Brorie visit the apartment, letting them know they are having a party later that night and it may get a little loud. The four get invited to the party, with some hesitation. Nick and Winston barely get their feet in the door before realizing this isn’t for them. Schmidt is instantly not liked by the neighbors because he makes a viciously unbearable asshead of himself, while naturally, the group with no TV that prefers hula-hooping takes to Jess after hearing her perfectly timed Urkel impression. The new neighbors strikes a chord with the main four. Schmidt realizes he isn’t as young and cool as he believes himself to be, while Jess sees that she doesn’t want to be as lazy and free of responsibility as people named Brorie seem to be. Seeing how down Schmidt is by his lack of youthful vigor, Nick goes into full pranking mode, spending somewhere between $1200 and $1300 over the course of the episode to make Schmidt feel old, shorter and constipated. Seeing Nick all jazzed up, Winston wants to have something in his life that means as much to him as ruining Schmidt’s means to Nick. Winston goes into his job revved up and becomes the producer of his own show—in the early morning hours, but hey, it’s a start. But like we saw last season with Jess and her students, something doesn’t work when the main group coincides with another group. Throw in a new love interest or two, that’s fine, but an entire group of younger kids doesn’t seem to draw the same excitement. However watching Nick literally give everything he’s got into pranking Schmidt works well, because it’s this core group dynamic that always works well. It is fun watching Schmidt engaging in activities that should fill the Douchebag Jar to its brim, but his audience of early 20s hipsters just doesn’t have the life the show usually thrives on. 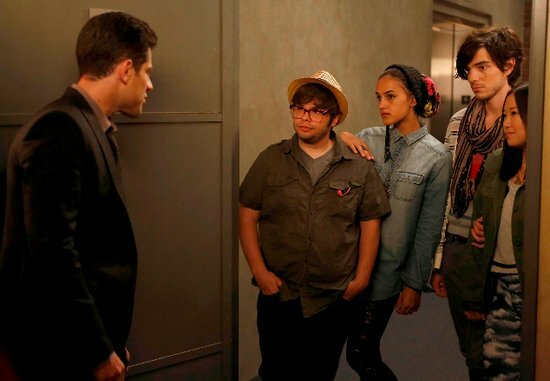 What “Neighbors” does bring is a sense of urgency to Jess, Schmidt and Winston that Nick felt at the end of the last season. All seem to be revitalized by the younger group, even though they will likely never be mentioned or seen again. Jess is empowered to not give up and move past shoveling casseroles by working as a tutor by episode’s end, and Winston is no longer content with being an assistant. It’s just a shame that they all couldn’t come to this realization without resorting to outside help.